Rainford Tennis Club members Jeff Bagerbaseh and Albert Arthur have been officially presented with their division winners medals by Men's 1st Team Captain, Dave Hillier. The pair, who are currently living in Ghana, represented the Green Army during the summer of 2012 and received their medals from Dave at the National Sports College in Winneba. 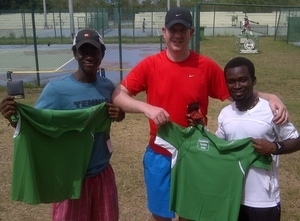 Albert and Jeff were competing in the 2013 Winneba Tennis Championships, which was organised by the Sam Jalloh Sports Foundation. Having won the doubles, the pair competed in the Men's Singles Final, which was won by Jeff 6-3, 6-4. Both Dave and our Head Coach, Sam Jalloh were in Ghana volunteering to run sports programmes for underprivileged children, as part of the Sam Jalloh Sports Foundation.